Heading south is always on the top of my mind as the winter snow begins to melt and the morning air changes from crisp and chilly to soft and warm bringing with it the promise of spring. This season my travels began in Logan, the northern most tip of Utah, for an annual tourism conference ... and would end with an 8-day river retreat for artists on the San Juan River, at the far southeastern end of the state and few miles from the Fours Corners area. The total of 10 days was the longest I have been away from Kya, my year old baby girl, spending some quality solo time with her daddy. In good and capable hands, yet I missed her dearly. After the long drive, I arrived in the small historic town of Bluff just before 10pm and pulled into Wild Rivers Expeditions to check in for my adventure, realizing I had missed the group meeting that evening. Yet I wanted to say hi to Kristen McKinnon, owner and fellow adventure loving gal-pal. 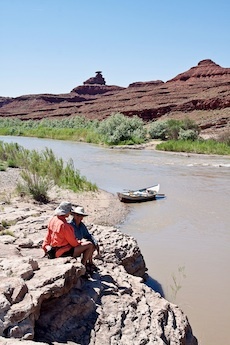 She promptly gave me the run down of the next eight days that I would be spending on the San Juan River. Unfortunately, she would not be able to join me for this journey. Morning arrived quickly; I rushed out of my bed and jumped in the shower, which would be my last hot one for the next several days. As I arrived at Wild Rivers, my fellow adventurers were buzzing around getting their belongings packed into river bags, checking that all camera equipment would be safe and dry and introductions all around. "Going for the Light in Dory Boats" was the perfect name for this artist's retreat which would allow ample time for participants to focus on their individual art. Some had sketch pads and colored pencils, others packed journals for personal reflections and poetry while still others packed heavy bags ever so carefully with valuable camera equipment. My craft of choice is photography. 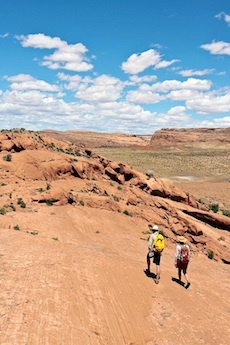 I've spent the last fifteen years traveling and photographing my adventures and the desert landscapes of southern Utah are always close to my heart. Spring is magic in the southwest - the brilliant colors of red rock mixed with the kaleidoscopic bloom of spring. The first day on the river gave everyone time to unplug from the daily lives we were all leaving behind, to connect with our natural surroundings and with each other. Dories are considered by some to be the "Cadillac" of all river boats and this was my first experience floating in these beautiful, brightly colored wooden crafts - a much different experience. The crew on this trip was a unique mix of professionals, each bringing a wealth of experience and unique knowledge to the voyage. 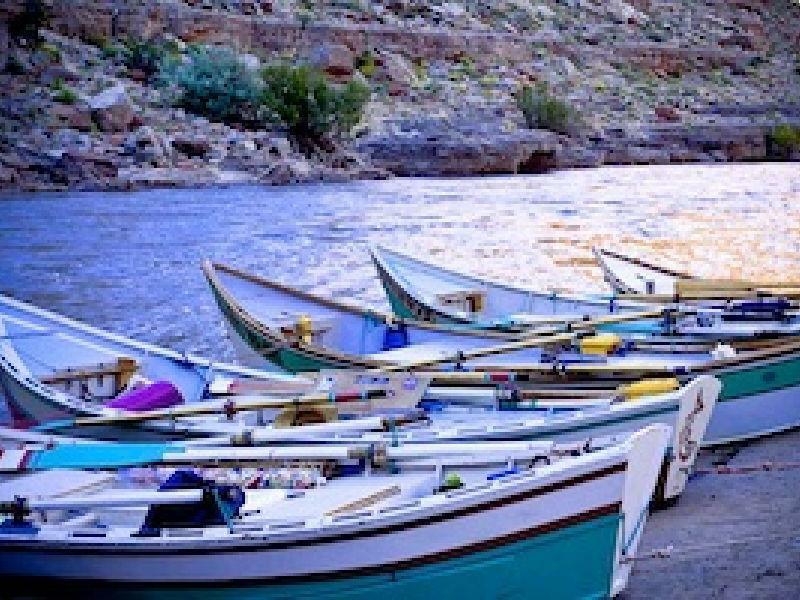 A geologist, an anthropologist and a biologist, all personally owned their beautiful boats that they each rowed on this adventure. Andy Hutchinson, the captain, has been custom building dories for over 20 years. 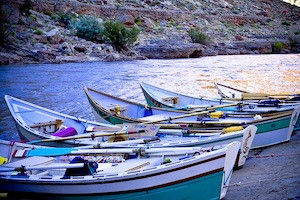 His company, High Desert Dories, is based out of Dolores, Colorado near the famed western river of the same name. 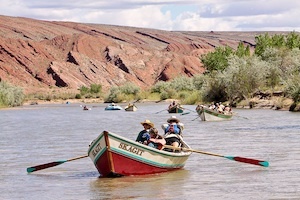 Kate Thompson, Andy's wife, is a professional photographer who has been rowing the rivers of the west for nearly 30 years. 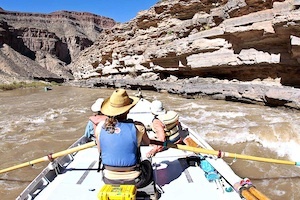 This handpicked crew added an amazing authenticity to our river exploration journey. By the third morning I was starting to feel a bit more relaxed and the anxious thoughts of missing my daughter and home were replaced with a peaceful joy that one can only find in the great outdoors, especially the desert. Today was a layover day, which meant a leisurely pace for the morning and a delicious breakfast. Wild Rivers prides its shore meals on garden fresh, naturally grown ingredients, very evident when you see the amazing garden they have on their property. Today was a big hike to explore a section of the 120-mile Comb Ridge, which consists primarily of striking up-warped Navajo Sandstone containing many, many remote archaeological sites. We began the hike together chatting about our surroundings, but by midday we all were hiking and exploring in small groups taking the time for a few artistic moments. That evening, following dinner, Andy, Kate and John entertained us with a trio of banjos and songs. Peacefully, we all sat on the beach listening and witnessed the color of the water slowly change to mirror the red rock walls of the river corridor as the daylight slowly segued into night. Day four was a short morning on the river followed by a big hike up Chinle Wash on the Navajo Indian Reservation and filled with many ruins, petroglyphs and pictographs. The first stop was at a rock art panel featuring a pictograph called the "Baseball Man". After a short discussion to analyze the meaning we continued on our journey. The day was a little cooler and had the promise of afternoon rain in the air. A couple miles down the trail we came to an amazing ruin high above the trail tucked in a hidden alcove. The afternoon rain was closing in on the group, so we quickly found shelter by crouching under some overhanging rock ledges just below the alcove. Twenty minutes later the storm had passed leaving the desert refreshed. The sights and smells were incredible and fresh, the wet red rock walls shined brilliantly in the sun and the flowers came alive and were amazingly vibrant. We all felt like we had experienced one of the Mother Nature's blessings and were in awe at how incredible our surroundings had become. The photographers in the group were quickly setting up tripods to capture the après rain desert light. 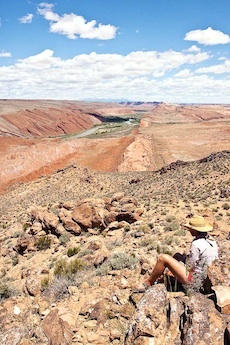 That evening, back at camp, we were joined by Serena Supplee, an oil and watercolor artist who creates marvelous works of the Colorado Plateau. She too owns a brightly colored Dory. Serena was a welcome addition to the top notch group of guides. We all were fascinated for hours that evening as she related stories of her adventures. Day five was the hike to the Mule's Ear Diatreme, a volcanic vent formed by gaseous explosion. The day was amazing, the sky a deep blue interspersed with many high cirrus clouds wafting through and the light stayed soft and warm throughout the morning. I stopped many times to just take in the beauty that surrounded me, continually capturing the moments with my camera as well. By day six the group felt like old friends, chatting easily as we were all feeling the connection to the river and the desert. I really enjoyed the duration of this trip since it allowed enough time to really get to know your fellow adventurers, their arts, vocations and interests. I have participated in many guided trips and one of the things I cherish most is getting to know the people, each from a different background and all coming together to have a quality outdoor experience together.